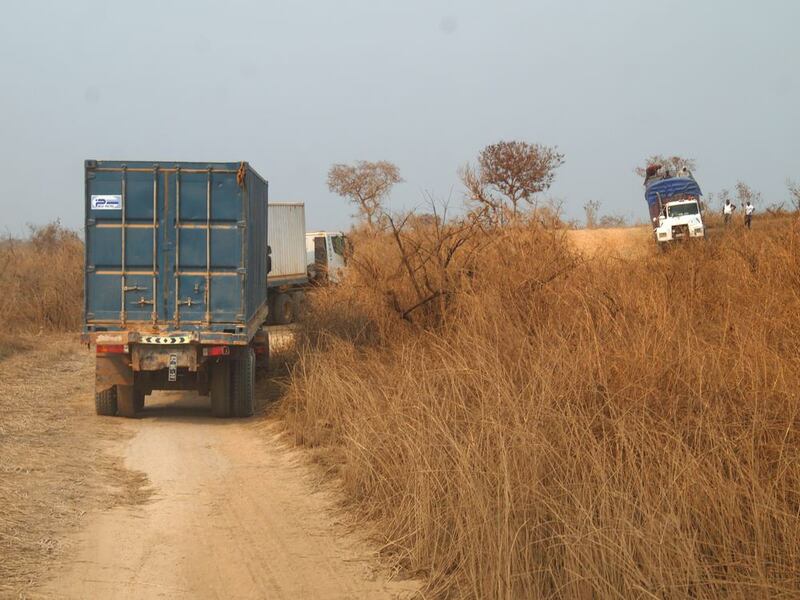 The border crossing into the Democratic Republic of Congo (DRC) was far easier than we had imagined. Thanks to the advice of our Belgian travelling colleagues Bram and Julie, we headed for Luvo, a much less busy option than Noqui into Matadi. It was so quiet that after we passed the first passport checkpoint on the Angolan side and decided to stop for a bit of lunch before tackling immigration, three policemen came and knocked on the door to see if we were alright – they’d been radioed and were expecting us! Only the vehicle-checking bloke was a bit officious, painstakingly reading every page of our carnet before passing us through; the next two stations merely filled our full names into exercise books. Sampson eased the tension at each checkpoint by doing a sleight of hand magic trick, ostensibly for other waiting children. This immediately transforms sulky officials into wide-eyed little boys who go call their mates to come see. 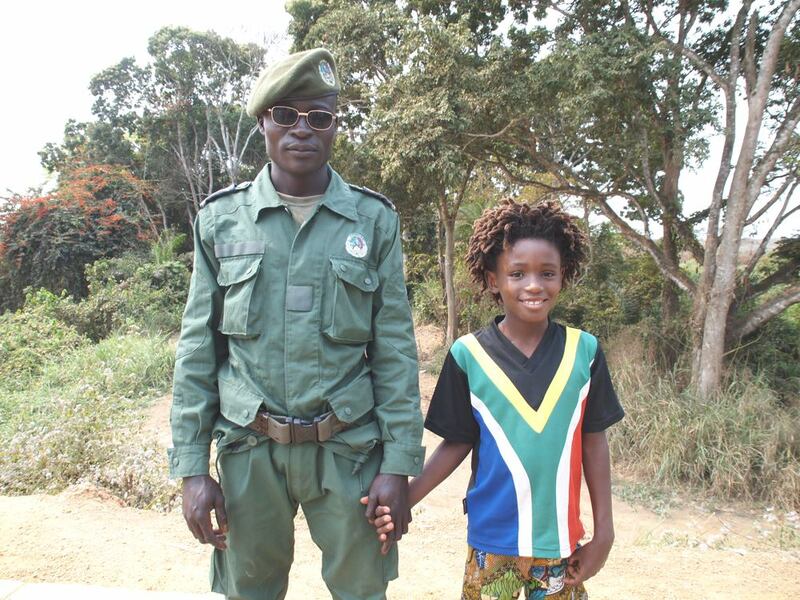 One particularly scary-looking military police dude in shades took a huge shine to Zola, eagerly comparing the darkness of their skins and declaring “He’s black like me!” He even agreed to a photo, which I would never have dared ask for under any other circumstances. So, the Big Green Truck trundled over a tiny bridge and there we were: in the Democratic Republic of Congo. I felt it deserved more fanfare. Unlike the entrances to Nambia and Angola, there was no welcome sign. All the stories you’ve ever heard about the DRC are negative and fear-mongering, so we couldn’t help but feel a little on edge, but the guy who pushed through to the front of the crowd to lead us through turned out to be genuinely on duty, guiding us towards a special welcoming office for travellers. Sat behind the desk was the charming Chef de Poste Lubo who chatted and switched on his aircon unit for us sweaty types – the humidity kicked in almost immediately at the border – even though he was wearing a T-shirt under a shirt under a suit of black velvet! After our fingerprints were scanned in, he gave us his card and warned us that the road out towards the highway was dreadful for first 12km. After 10km, we saw police ahead with guns waving us down. We braced ourselves for trouble, but they were just preventing big trucks from crossing an unsafe bridge! They explained the alternative route and one even whizzed back on a moped to check we’d located it. Soon however, we heard sounds of other humans emanating from nearby and a muscular young man emerged, naked to the waist and holding a panga. He greeted me respectfully and apologised for being so dressed – he was cutting down deadwood preparing for the post-harvest burning. He was pretty hot himself and when he said his name was Parfait I struggled to keep a straight face: Parfait means Perfect in French. South Africans are used to people called Beauty or Precious or Gift, but I hadn’t considered until that moment that the African tradition of meaningful names would translate across all languages. 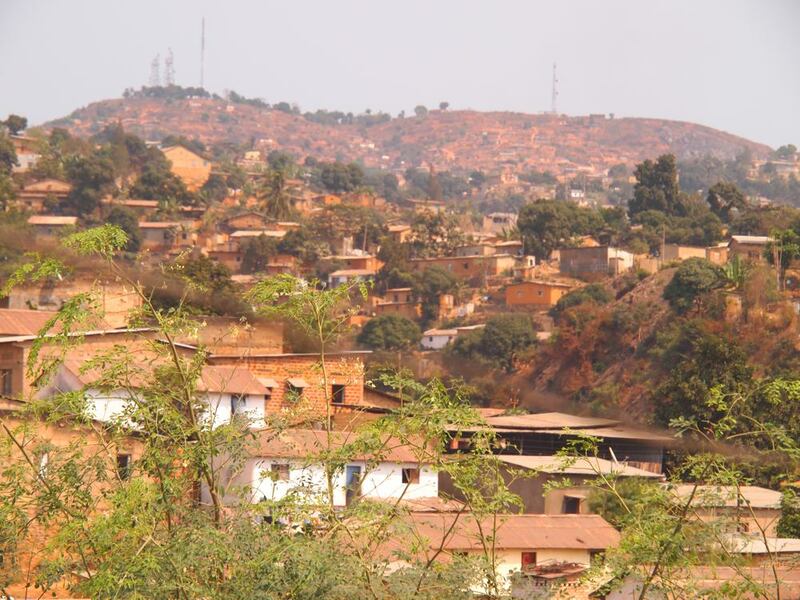 It’s so great being in a Francophone country as I did 7 years of French at school in the UK and don’t feel as clueless as I felt most of the time in Angola. The night before we left Angola, Sampson managed to bump into bloke on the street called Felipe Payi who spoke English and start a philosophical chat with him about Africa and the environment. He invited him into the truck at about bedtime and ended up interviewing him on camera. This is typical of my husband, and we love him and hate him for it. He happily talks to everyone, all the time. He never stops talking. Even when the kids are dropping with exhaustion and the chattee himself is growing weary, Mark is still hyped up on the human sharing. Felipe was fascinating – when he could get a word in – one of 24 children, his father had 9 wives. He has a brick factory, but is also a gospel singer and had just recorded a track in praise of President de Santos. He played us a rough edit on his phone, paraphrasing the chorus as ‘Don’t wait till he’s dead, thank him now’. He also told us that in his language – Kikongo – ‘Zola’ means ‘love’ in the sense of union, togetherness and peace among people. I felt this boded well for our reception across the border. Somehow I’d not managed an uninterrupted night’s sleep since Zola got sick about a week ago. I was also a bit worried about my husband. His ongoing back problem – which had him completely prostrate for 9 months of last year – was giving him some pain. He’s noticeably lost weight, though that might be due less to the grieving process as the fact that truck life has forced him to abandon his habit of chomping four squares of Dairy Milk every time he passes the fridge, as well as his midnight breakfast cereal binges. So on this first day in the DRC I suggested “Today I drive; you teach and cook” – a change is as good as a rest for both of us, I thought. However, after less than an hour, the filter blocked again, starving the engine of fuel, and Sampson had to take over. 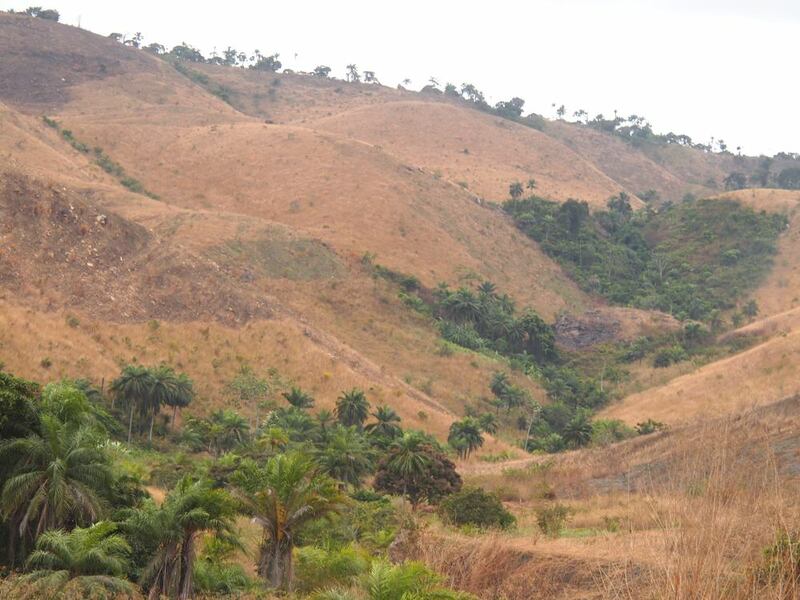 I got off lightly, because coming into Matadi, we were expecting the crazy twisty-turny road to flatten out into a valley – but it didn’t. The city is all piled up on steep hills, and driving along the narrow way in with people thronging around market stalls lining each side of the road was possibly the most colourful spectacle of site specific theatre I’ve ever seen. It was also possibly the most stressful section of driving yet for Sampson. Vertical potholes. Luckily there were traffic police at every major intersection who continually waved us in the right direction. Until the very last guy who started off all strict, demanding to see our papers, and ended up escorting us, on foot, all the way to my Arterial Network contact – and then swapping phone numbers! 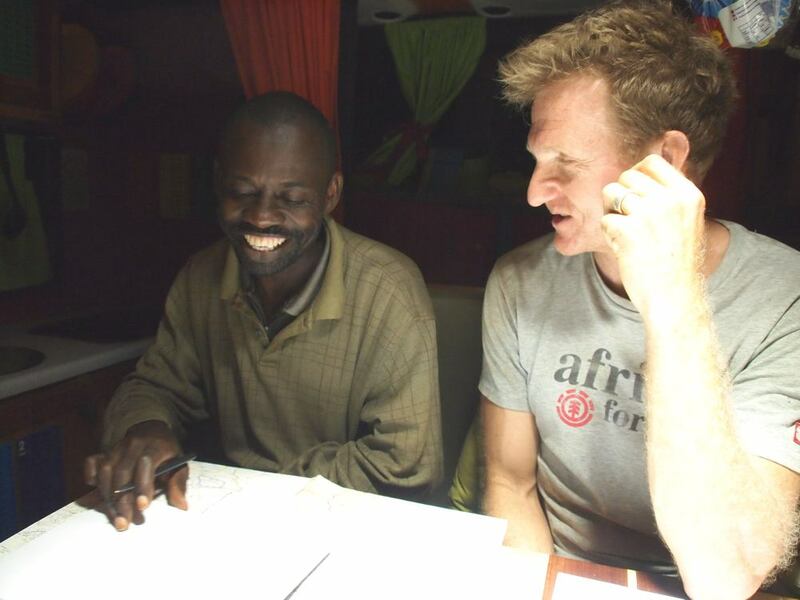 Jean-José came to the truck and immediately began to write letters of introduction to local hotels to ask for cooking oil. His colleague Edouard Tutolana, who I assumed was a young protégé of his, turned out to be the same age as me! They have missioned about tirelessly on our behalf. Sadly, after the second day, when we visited three hotels trying to source oil and then watched a fascinating rehearsal at Liak’ Likumbi, Jean-José was called away to a family funeral in his hometown. Jean-José had arranged for us to sleep on the relatively flat main road of his Quartier Mbuzi, as the road up to the back of Liak’ Likumbi was inaccessible. The first two nights were fine, give or take the odd passer-by banging on the side of the truck and the groups of kids who congregated outside the door to watch the soap opera of our life. The first day I took a walk up the street, up the hill, past the Centre, drinking in the early morning activity. 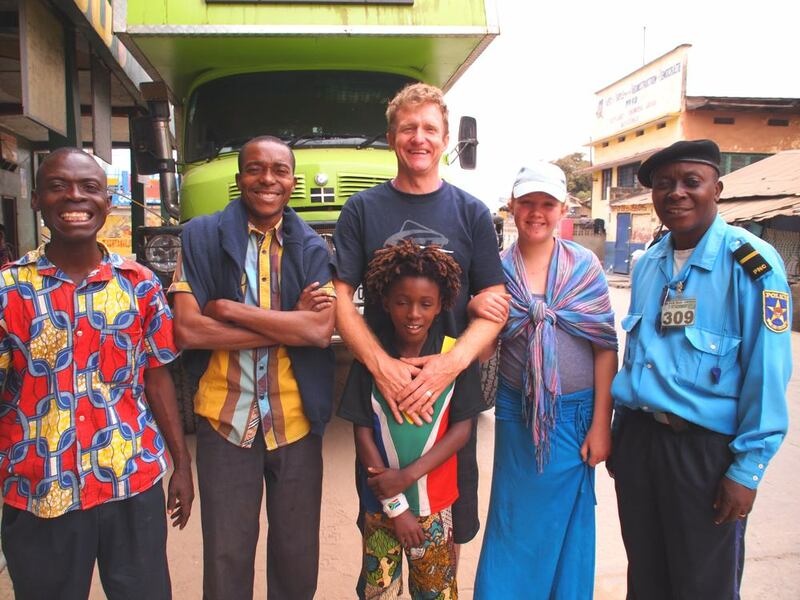 Jean-José had taught me the basic Kikongo greeting: ‘Mbote na nge’, or ‘Mbote na beno’ for more than one person. If I follow these phrases up with ‘Inki faso? Fioti fioti’ that normally floors most people. There are over 450 languages in this country, and apparently even people from Kinshasa who’ve lived here for years can’t be bothered to learn Kikongo. At the top I stumbled into the 7am Catholic Church mass and was completely bowled over by the warmth and sincerity of the occasion. A packed congregation of around 250, both young and old, greeted the day, intoned ‘Zola’ in unison and clasped hands with their immediate neighbours (including me). 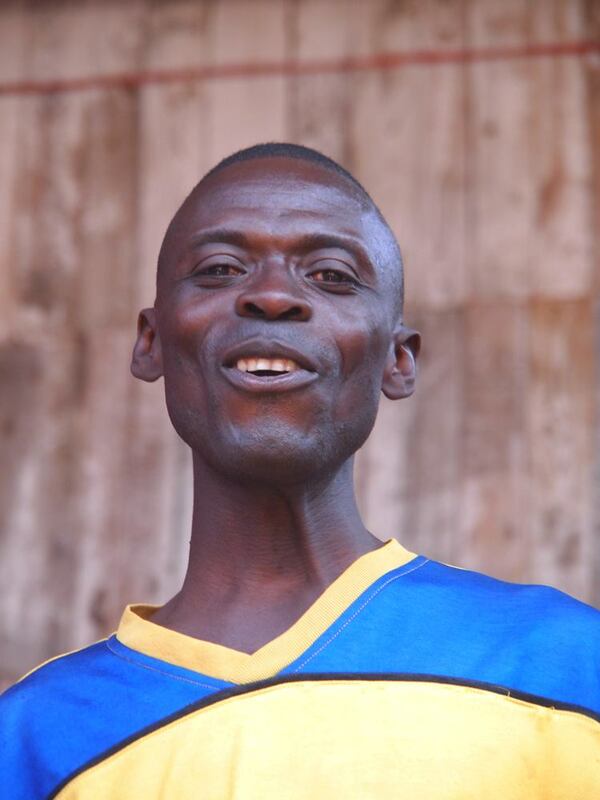 A swaying purple-scarfed choir led them in delightfully upbeat hymns accompanied by a sole djembe. Church was never this cool when I was a kid. The difference in attitude between the diffident, relatively reserved Angolans and the defiantly Congolese was very much in evidence as soon as we hit the border. Suddenly it seemed all the men were wearing sunglasses. Skirts were narrower, prints bolder, tops more fitted, all with flounces. In Angola, girls do their hair with different coloured hairbands. In the DRC it’s the hair that’s all different colours, and every style is unique. Eyebrows are often drawn on, lashes false and shadow can be blue, purple or gold. Generally, the look is far more flamboyant, with occasional insolence. 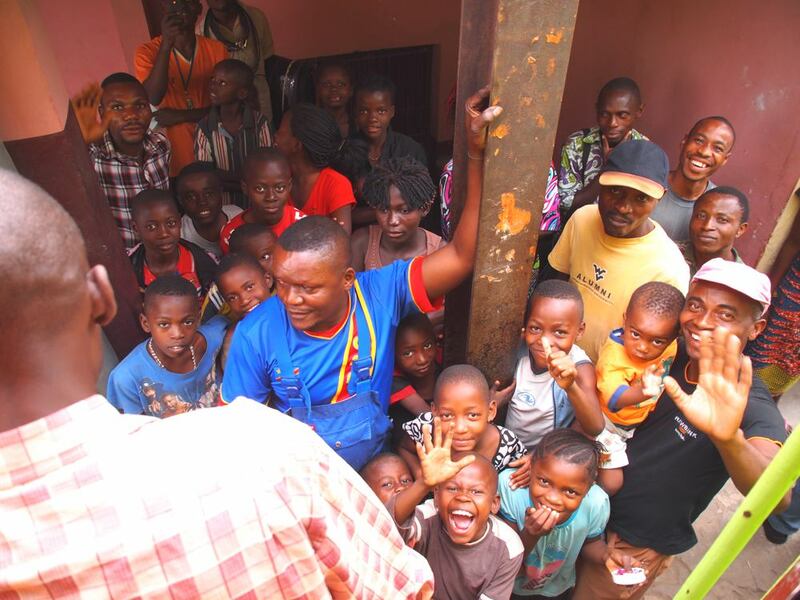 Adult Angolans greeted the sight of the truck rolling up with open mouths. The Congolese barely raise an eyebrow. Perhaps it’s because we’ve moved into Francophone territory, but the vibe is far more nonchalant. 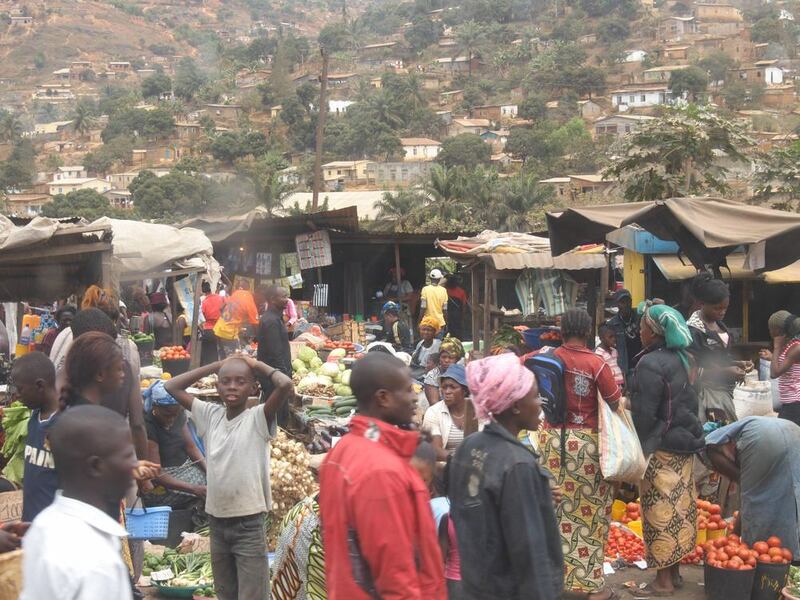 I should add that only in the DRC have we seen men carrying loads on their heads, sweeping outside their shops and houses and even scrubbing the floor, bless ‘em. This never happened in Angola. It’s like we’ve moved into a different era. Meanwhile, the hunt for oil had proved fruitless. Since the government moved the provincial capital elsewhere, there are very few people staying in hotels; the only hotel that agreed to give us some had just 2L to donate. No one ever throws cooking oil away here, it just gets sold on and reused. So on day four of our 15-day-stay visa, we decided we had to buy oil. Vegetable oil is imported and relatively expensive, so local palm oil seemed a better option. Edouard kindly sourced the cheapest for us, and came back with the 200L Sampson estimated that we needed to make it safely to Brazzaville. Of course, in hindsight, it would have been more sensible to buy 25L and check the quality first. Sampson was horrified to discover that what we had spent $210 on was raw palm pulp rather than palm oil. For a bleak few minutes, it seemed we had thrown our money away. While he phoned his fundi Org from BioGreen in SA to get advice, the crowd grew around the pile of oil containers. We had an audience of around 50 by the time I managed to translate for Edouard that to refine the oil would involve mixing it with sulphuric acid, leaving it overnight and then heating it up to 70 degrees Celsius. As I described the de-gumming process it seemed completely impossible and I felt totally disheartened, but at once voices from the crowd started chipping in with ideas. Someone knew where to get battery acid. Someone else had a large metal cooking pot. We could heat it at the Centre while Jean-José was away. Suddenly, on this tide of communal goodwill, it seemed possible after all. Et voila, le ‘Laboratoire Mark et Edouard’ came into being. That night, reflecting on the day’s events, I felt very humbled by the way the locals had taken on our challenge and made it their own. The kids and I had taken a crazy taxi car ride up to the Centre with 5 blokes and 8 oil containers, and mixing vessels had appeared, while Edo and I missioned to find sulphuric acid. Sampson had supervised the mixing process and the outcome was eagerly awaited by all. We celebrated with an episode of 30 Rock on Mark’s Macbook courtesy of Digicape (quite surreal in the circumstances) and happily dozed off. At 11pm, there was persistent hammering on the side door, and a shout of “Police!” Looking out the window, I said to Sampson, “You’re not going to believe this, but there’s a bloke in a T-shirt with an AK47 outside”. He was young and looked wired; addressing me as ‘Mama’, he asked if we had permission to be here. I showed him the letter Jean-José had lodged with the Bourgmestre and he said “Well, this is a very dangerous place, there are many bandits and you should have security.” He spoke very fast, but I swear he said something about a “Red Zone”. I responded that everyone here had been “tres gentil” and we were quite happy thank you. An hour later, there was another hammering at the door. An older man led the conversation this time, flanked by a real policeman in a blue uniform with another AK and a number of nosy neighbours. The original dude stood at the back of the crowd, holding his machine gun across his chest in time honoured fashion, but this time wearing a bright red balaclava hood. Honestly. We played it dumb: Sampson sat behind while I knelt on my knees in the doorway wearing only my wrap, listening to them, pretending my French was poorer than it is, failing to understand the broad hints for protection money. After about 10 minutes, I suggested that my friend Edouard was arriving at 9am and could help translate. Just then a dignified man in a beautiful shirt arrived and told me to shut the door. I think he was a friend of Jean-José. He pacified everyone and the crowd dispersed. The two gunmen stayed outside the truck the whole night. Blue Uniform dozed in a chair, but every hour or so, Balaclava Boy would kick up a huge fuss with some innocent passers-by, whether or not they’d just given the truck a friendly tap on the side. He did a lot of shouting, I presume in an attempt to prove how dangerous the area was. He didn’t know I could understand the neighbours remonstrating with him about ‘tranquilité’. At 6am, I opened the door and offered rooibos tea to them both; on tasting it, they each pulled a face and took four spoonfuls of sugar. At 7am they’d disappeared. It seems someone had put the word to Jean-José who had alerted a support team. Edouard arrived early and by 9am we were at the municipal buildings waiting to see the Bourgmestre, the equivalent of the ward counsellor. The half-hour Edouard had anticipated turned into an all-day bureaucratic marathon. We first explained the story to the venerable Monsieur Luchisa, then, when he arrived, to his bustling Chef (boss) Monsieur Mame (or Frank as he became known). Monsieur Frank came down to the truck to check our visas and decided to take them to his Chef to be checked. We took a taxi into the centre of town, and explained all over again to the intellectual Monsieur Faustre. Monsieur Faustre found our climate change educational mission inspirational, and spent a while declaiming to his staff about the importance of our project and the implications for the continent. Then his engaging and softly spoken Chef, Monsieur Marin, whose English was far better than he let on (n’est-ce pas Monsieur?!) arrived to see if he could assist. By this point I had been conversing in my weak French continuously for six hours and was beginning to wilt. There was copious copying of documents by underlings. Finally, I was escorted to a place that the DGM had decided would be more appropriate for us to stay. We were received by the Soeur Julienne into the school grounds next to the Convent of the Sisters of Charity, and she has been kindness itself. Monsieur Frank arrived at the truck to ensure our safe transfer, and Papa Faustre and Monsieur Marin popped in the following day to check everything was OK. We really have been overwhelmed by their assiduous care and attention. No one however, has been more attentive than Edouard. 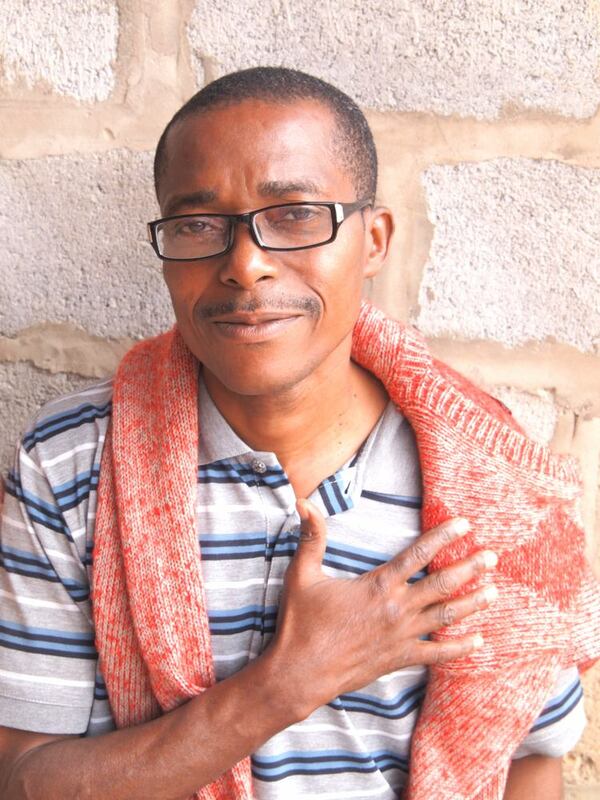 Jean-José entrusted us to his care, and he has taken the responsibility very seriously. He has been by our side every step of the way, from early in the morning until late at night. He has patiently attempted to explain to me various aspects of local culture, from telling me the history of Prophet Simon Kibangu, who has 3 million followers, to how to properly crack a groundnut. 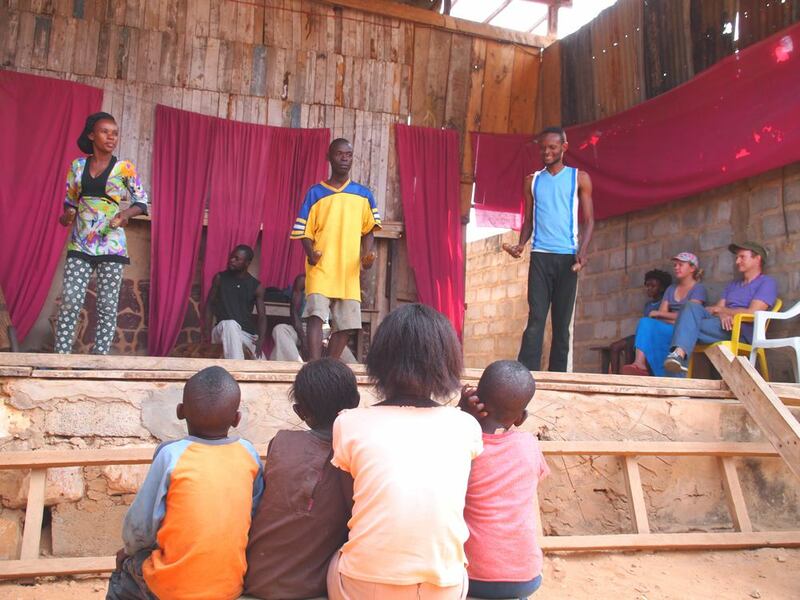 At first we had thought Edo shy, until he got onstage during the rehearsal at Liak’ Likumbi of the theatrical rendition of a girl’s initiation rite and revealed himself to be a performer of great range and presence. He admitted to me that he loves any chance to address a crowd, which of course happens often if you’re dragging a whitey round town looking for sulphuric acid! So for four days the experiments at ‘Laboratoire Mark et Edouard’ have continued. Various strengths of acid have been hunted down (with disaster being narrowly averted when it melted through a plastic container on arrival chez nous) and several different heating procedures have been attempted. Sampson has not yet reached a satisfactory outcome, but has learned a lot about the purification process – palm oil is the staple of West Africa so if we’re going to travel through, we need to know if this is doable. I’ve been struggling to make sense of Congolese francs, which are nearly 10 to the Angolan kwanza, which are about 10 to the rand, which are 10 to the dollar… A 500CFr note is worth R5. There are no coins, and you rarely see higher than a 1000CFr note, so you are dealing with wads of very worn cash just to get a few vegetables. We are eating a lot of aubergines, tomatoes and delicious bananas. We’ve been introduced to fufu, the staple food, which is sold on the street in lumps wrapped in banana leaves, and made by allowing pounded manioc root to sit for three days and ferment. It produces a chewy starch which you can dip in sauces, which looks a bit like grey staver pap, and tastes a bit like sour worm gummy sweets but without the sugar or flavour. None of the other Sampsons will eat it, when they have several delicious varieties of pain to choose from, but it’s a welcome addition to my diet: it doesn’t contain gluten, it’s very filling and I don’t have to cook it – hooray! DRC children only go back to school next week – terms seems to run in sync with the European scholastic year – so it’s been super peaceful here in the grounds of the Lycée Vuvu-Kieto after living in a city street for four days. We’ve been able to do washing, hang all the bedding out and treat it with anti-mosquito spray from HealthGuard. The little critters have become far more prevalent, and we’ve now got our nets up as well as the window screens. Yesterday I desperately wanted to post this, but Edouard wanted us to visit his home. 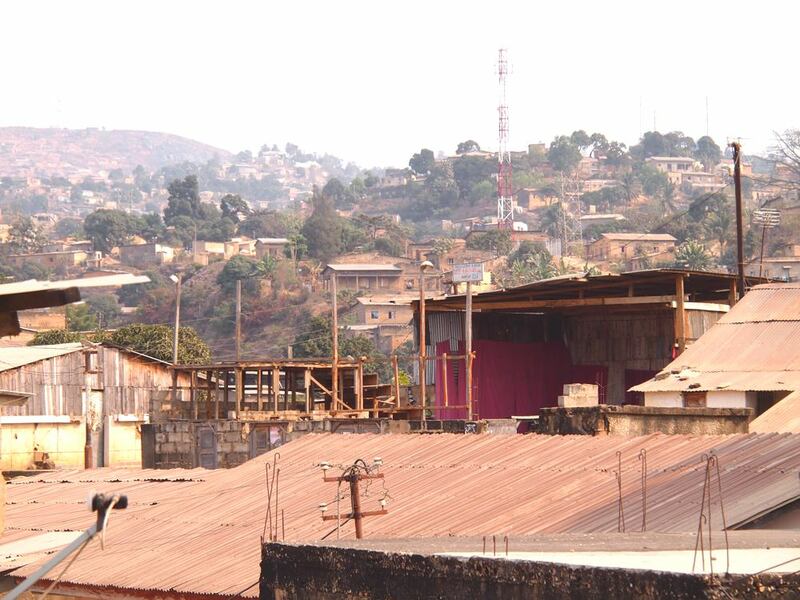 The kids and I took one more crazy taxi ride up to the Quartier Nzinga Lutete, a semi-rural area high above the city. It’s the biggest quartier, and the most inaccessible. 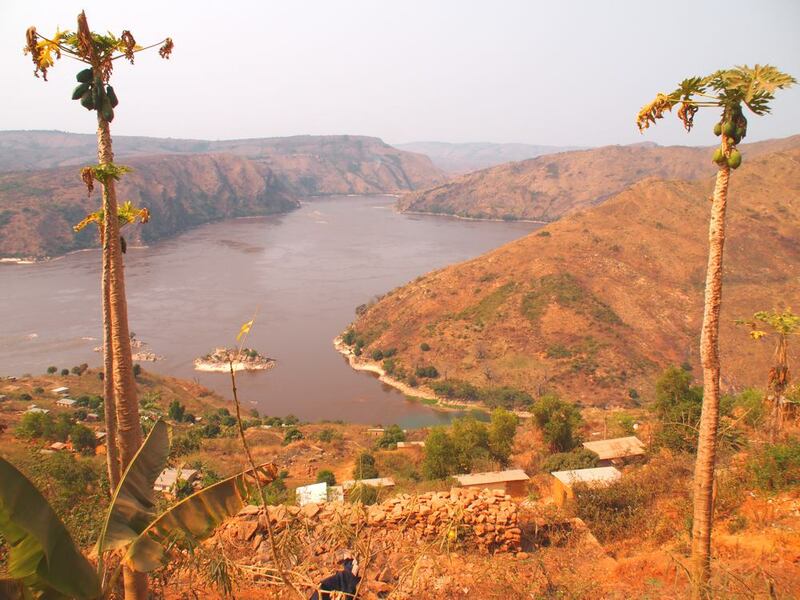 We walked the last kilometre or so to his place up steep pathways between clay brick houses – Zola was impressed to see boys making some bricks by hand in a wooden mould along the way – and were rewarded with the most spectacular view of the intersection of the Congo and Mpozo rivers. 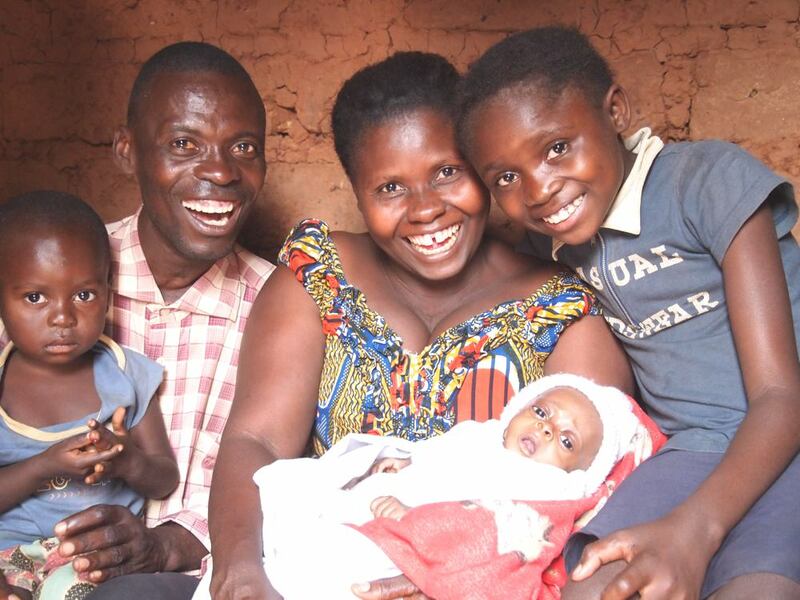 We met his lovely wife Makoko and were introduced to their two youngest sons, Aimé, 2 and Jacques, 5 months. Edouard’s 17 year old eldest was out at church. His name is Lineker, and yes, he was named after Gary and apparently he is very good at football! This entry was posted in 03 DRC and tagged 03 DRC, Africa Clockwise, BioGreen, Digicape, eco-travel, Freeform Tents, HealthGuard, Liak' Likumbi, Matadi, travelling Africa, travelling with children. Bookmark the permalink. Hope your chemistry project is successful! I really enjoy your entertaining writing style Sam. Hope all goes well – waiting for the next chapter of the adventure. Enjoy! Amazing stuff! I’m just sitting around in my pants about to make tea! I am so incredibly happy for you all. So pleased you are doing it, so pleased it is working out…and I love reading the blog Sam. One thing I have thought about is how you are so well organised….Africa is not the easiest place to travel but you seem to be doing it just fine. With all your back up too……wonderful. Your work is paying off. I have put many people onto this blog..and all are full of admiration for you. Glorious read! Thank you so much for sharing and blessings for your travels! P.J.Wallis Peter Joh… on Egypt 3: Alright Giza?